I just love this site and all you do. Thanks and Merry Christmas. How cool is that!! Love it! Thanks for the giveaway!!!!! I LOVE TotallyTarget and am often surprised how many Target employees are amazed at my savings…I tell them to check out your website! Merry Christmas and thank you Totally Target! This would be great for last minute gifts or after Christmas sales! Wow what a cute card! Already “like” you on fb! Thanks for helping me save so much money! Thanks for sharing. Winning the gift card would be great. Wow- thanks for all the great giveaways:)!! What a cute Idea on Target’s part! As always, thanks for the giveaways! Love your give always! Who doesn’t love Target!! Merry Christmas! I know you have helped make mine pretty merry! I like you on Facebook! Thanks for the chance to win! Merry Christmas to all! I love target! How cute!!! 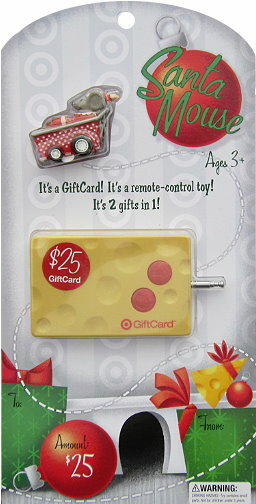 I’ve never seen a gift card like this. Awesome! Love Totally Target. It is a big help. Thank you for all your shopping help.